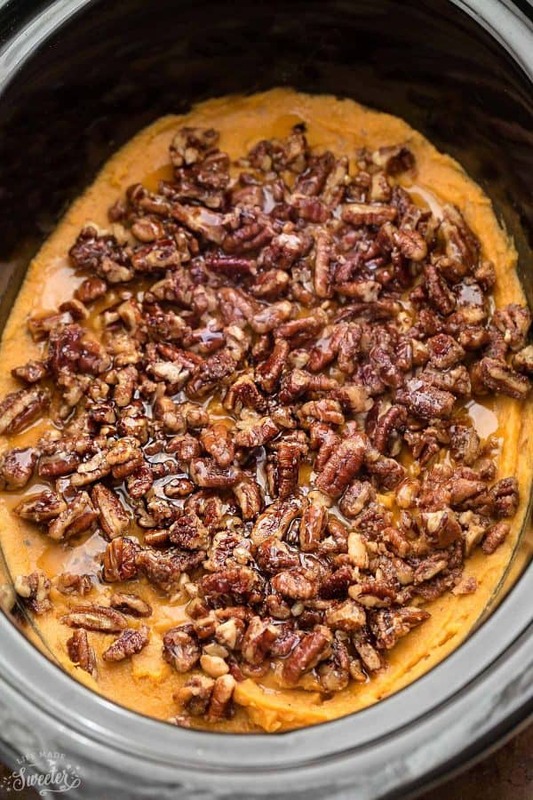 Slow Cooker Sweet Potato Casserole is the perfect easy, healthy and paleo-friendly side dish for Thanksgiving. Best of all, it’s made entirely in the crock pot (plus oven instructions), saving you valuable oven space. No pre-boiling the potatoes required! I’ve got another Thanksgiving side dish again! 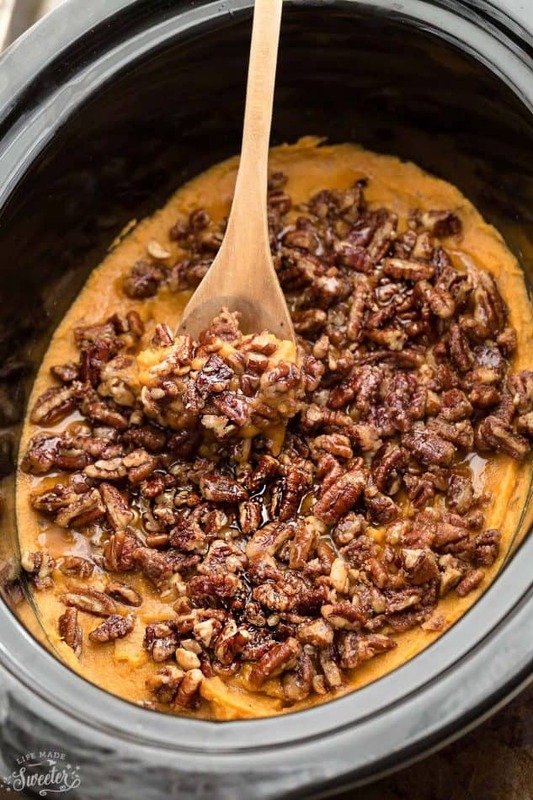 If you’re looking for a few lightened up versions of some classic Thanksgiving side dishes, this Paleo Slow Cooker Sweet Potato Casserole would make a delicious addition to your holiday table. It’s gluten free, grain free, dairy free, refined sugar free, and can be made either paleo or vegan (simply leave out the egg or use an egg substitute). Plus since you make it in your slow cooker, that means one less thing to worry about taking up precious oven space on the big turkey day. And now that I have an Instant Pot pressure cooker, I definitely need to try making it in one as well. This Sweet Potato Casserole starts off with a smooth and creamy sweet potato puree. You’re going to add a little bit of milk (almond and cashew work great), some pure maple syrup for an extra touch of sweetness, coconut oil and a little salt and vanilla to round things out. You can make this sweet potato casserole with eggs and without. I’ve tested it out with both and they each turned out great. If you’re using eggs (or an egg sub), they bind everything together and give the sweet potato casserole some structure. The sweet crunchy topping means you can totally skip the traditional marshmallow topping. Instead, there’s a coating of maple syrup, almond meal and some cozy cinnamon and nutmeg. This sweet potato casserole makes a delicious and healthy side dish so that you’ll still have enough room for dessert. 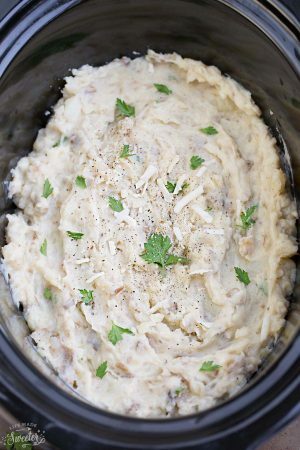 Make it ahead – you can make the mashed potatoes the day before. Just mix up the topping right before you cook it in the slow cooker. If you’re going egg-free – just leave out the egg. It will still tastes great but the texture will be a bit looser and more like a puree than a cohesive mash. Use a little less milk for a thicker mash or use a chia egg or egg-sub. This recipe includes directions for the slow cooker and the oven. 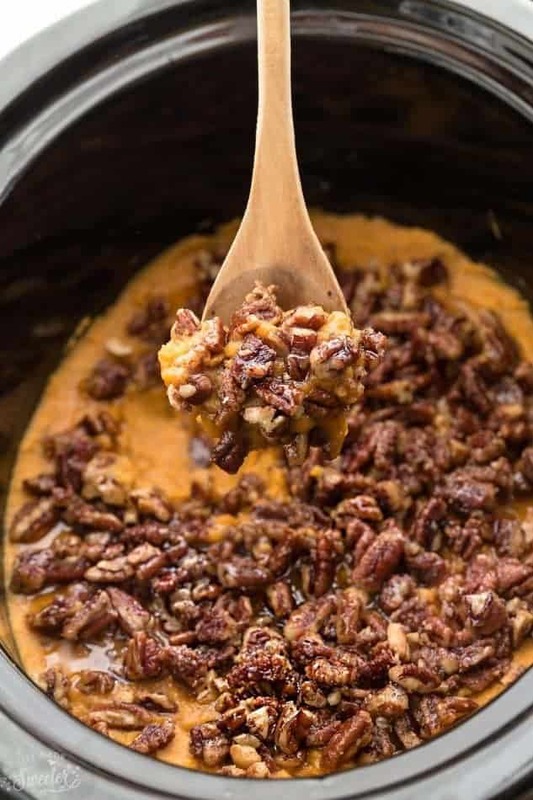 Paleo Slow Cooker Sweet Potato Casserole is the perfect easy and healthy side dish for Thanksgiving. Best of all, it's made entirely in the crock pot, saving you valuable oven space. Coat the inside of your 5-6 quart slow cooker with cooking spray. 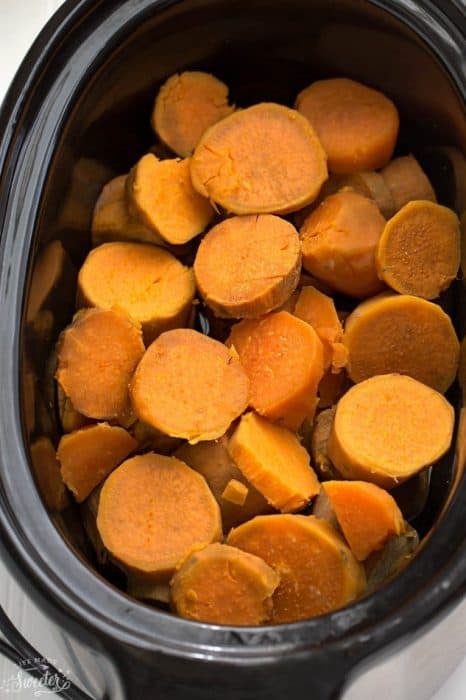 Place the sweet potatoes in the bottom of your slow cooker. Cover with lid and cook on high for 2-3 hours (check if your slow cooker runs hot - mine are usually done at around 2 1/2 hours) or until potatoes are soft and tender. 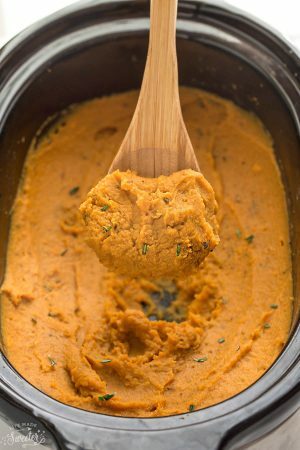 Using an immersion blender, hand mixer or a potato masher, mash the sweet potatoes right in the slow cooker. Add the milk, coconut oil, maple syrup, vanilla and egg and mix well until combined. Add more milk (1/2 tablespoon at a time) if mash seems too thick. Smooth the surface. Sprinkle over the sweet potato mash. Cover and cook on high for an additional 45 minutes - 1.5 hours depending on how hot your slow cooker runs. Serve warm right out of the crock pot. Grease a large oven-safe casserole dish (about 9x13) and set aside. Add the potato chunks to a large pot covered in water by at least 2-3 inches of water. Bring to a boil over medium-high heat. Boil until completely tender (potatoes will pierce easily with a fork) and drain well. 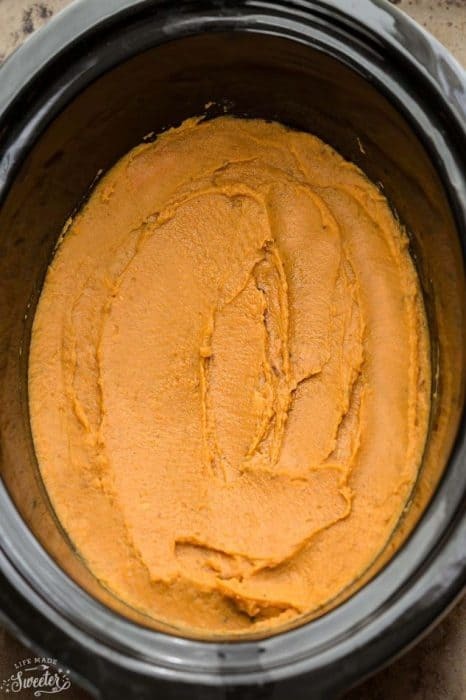 Using an immersion blender, hand mixer or a potato masher, mash the sweet potatoes right in the pot. Add the milk, coconut oil, maple syrup, vanilla and egg and mix well until combined. Add more milk (1/2 tablespoon at a time) if mash seems too thick. Transfer mash to prepared casserole dish and smooth the surface. 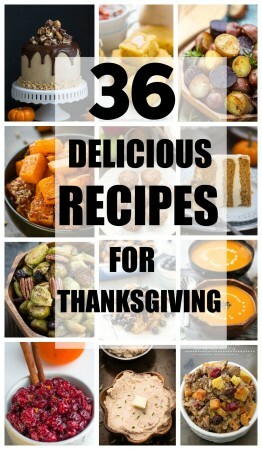 (You can make the sweet potato casserole up to this point the day before serving, if desired. Just cover the baking dish and refrigerate). 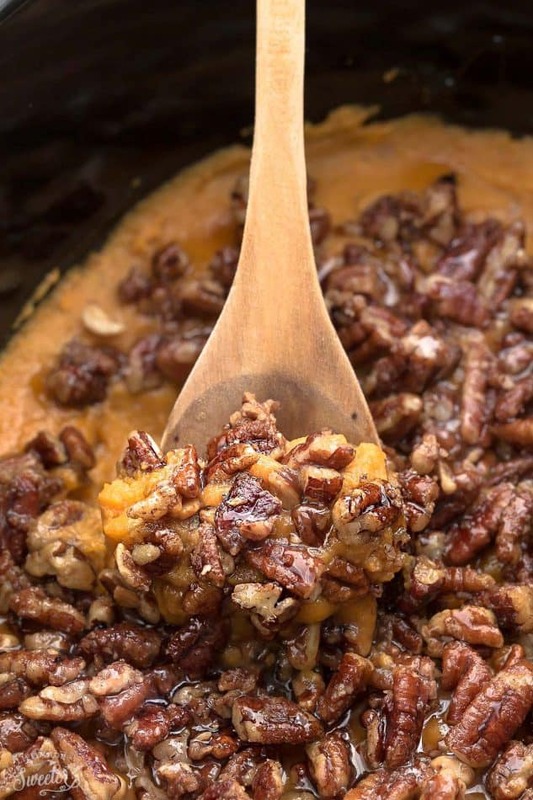 Combine pecans, oil, maple syrup, flour, cinnamon, nutmeg and salt and sprinkle over the sweet potatoes. Bake in preheated oven at 350 F for 25-30 minutes. Remove from oven and allow to set for 5 minutes.